Toyouke Chaya is very close to the torii gates of Kitano Tenmangu. Toyouke Chaya is a tofu restaurant which only serves lunch, and which began operating in 1992. The restaurant’s starting point was the wish of the owner of the tofu shop Toyoukeya Yamamoto to serve excellent tofu and yuba (tofu skin). There is often a line in front of this restaurant, and up until recently the line consisted mainly of locals and Japanese tourists, but recently they’re getting more and more guests from overseas too. As the restaurant is run by a tofu shop, they know everything there is to know about tofu and yuba. Because of this, their tofu meal sets and rice bowls are just the thing for those of you who want to eat tofu when traveling to Kyoto. They have menu items which let you enjoy tofu to the fullest, like their simple yudofu (boiled tofu), yuba-rice bowls with mitsuba (Japanese wild parsley) and ginger, and even tofu yogurt for dessert. Yudofu in Kyoto may have an expensive image, but here at Toyouke Chaya you can enjoy yudofu at very reasonable prices. During the plum blossom season and on the 25th of every month when the Tenjin-san flea market is held there are even more people than usual lining up for Toyouke Chaya, but I would still like to recommend this restaurant to all of our readers. With this meal set you get six seasonal dishes such as yuba sashimi, tempura made of yuba and locally grown vegetables, crumbled tofu, but you also get rice, suguki pickles, and a bowl of clear soup called suimono. If you order this meal set, you also get one of the classic dishes of this restaurant, a tofu sweet, as dessert. One of this restaurant's classic dishes is the yuba rice bowl. The big portion of yuba you get is seasoned with kudzu, also known as Japanese arrowroot, mitsuba, and ginger, making the dish delectable. Many people visit Toyoukeya Chaya just to taste this dish! You get to choose your tofu from the different kinds of tofu they sell at Toyoukeya Yamamoto, and then have it made into yudofu. You get to taste yudofu, one of the dishes you must try when you come to Kyoto, for a very reasonable price. This soy milk yogurt is made using a Caspian Sea yogurt culture. Of course, the yogurt contains a lot of soy milk made right here at the restaurant. This dessert item resembles the hard work that goes into everything at this restaurant and the way they make everything themselves. 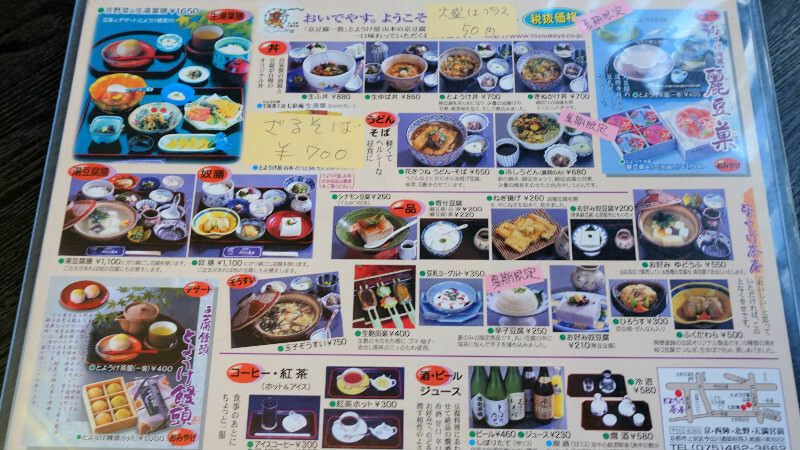 They don’t have their menu in English, but it has pictures to help you order. 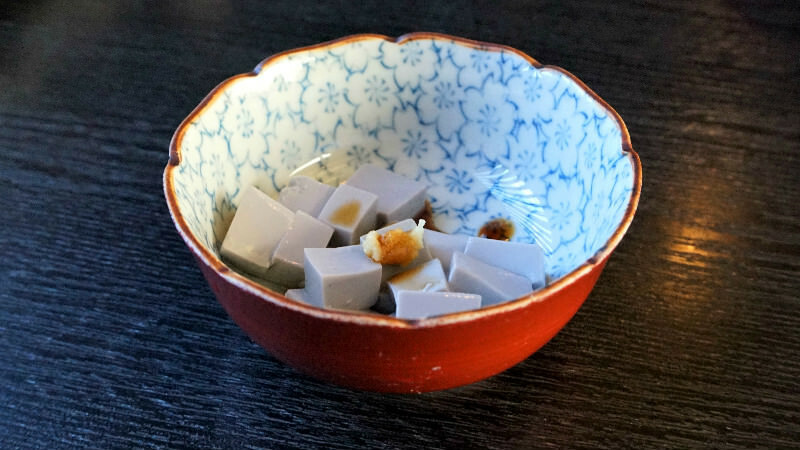 Before your food, you get a tofu-appetizer, of course, handmade at this restaurant, which changes seasonally. If you go to this restaurant, you're in for an excellent tofu experience. They offer almost everything with tofu: even their yogurt contains tofu! As their dishes don't use meat, this place is also great for vegetarians who like Japanese dashi. Their hot tofu dish, known in Japanese as yudofu, is also very tasty and creamy, so if you want to try this Kyoto specialty, Toyouke Chaya is a great place for it. A 0-minute walk from Kyoto City bus Kitano Tenmangu-mae bus stop, or a 5-minute walk from Keifuku Randen Tram Line Kitano-Hakubaicho Station. Restaurant: 11:00 a.m.-3:00 p.m. Shop: 10:00 a.m.-6:00 p.m.
Thursdays, but open if 25th is a Thursday. One additional irregular holidays twice a month. They may not speak English, but many visitors from overseas go to this restaurant so they’re used to serving people from overseas. Their menu has pictures on it so ordering shouldn’t be too difficult.